NY Laughs is a performing arts nonprofit that beilieves that when laughter is part of a collective public experience it builds community, strengthens the bonds between us, and makes the world a happier, healthier place. Our aim is to make comedy a part of the daily experience, celebrate the comic arts and improve everyone's quality of life by producing free comedy performances in public spaces. Since starting NY Laughs, we've worked to change the cultural landscape of this city by helping audiences appreciate stand up as a unique NY cultural asset. 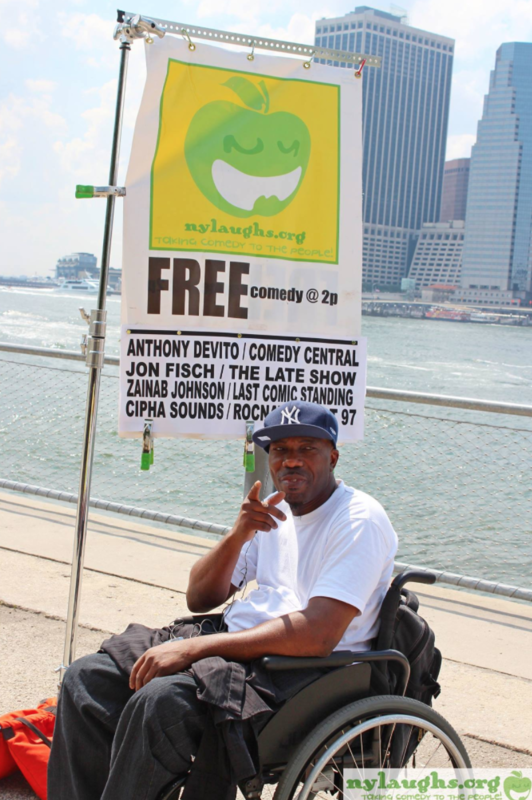 NY Laughs wants to make NY a better place through laughter. Comedy brings people together in peace and harmony and we estimate having made over 20,000 New Yorkers laugh since 2007. NY Laughs is a 501(c)(3) non-profit performing arts organization. As a result, any donation is tax deductible to the fullest extent allowed by law. With an all-volunteer staff, 100% of your donations are put directly toward programming. Our shows have been critically acclaimed and we have won numerous grants from the New York City Department of Cultural Affairs and the New York Council on the Arts via the Lower Manhattan Cultural Council, as well as the Washington Square Park Conservancy and Partnership for Parks. Additionally, we've won funding from the NYC City Council. We've been honored to have artists appear such as Amy Schumer, Hannibal Buress, Michael Che, Phoebe Robinson, Michelle Wolf, Roy Wood Jr. and more. We've had NY political figures, too take the mic to make their comedic debut on our stage.